Accra, Ghana, 28 February 2018 - Emirates Skywards, the award-winning loyalty programme of Emirates airline, has reached 20 million members. To celebrate this major milestone, Emirates Skywards will be celebrating with its members. Those travelling from Dubai on Emirates flights during the week beginning 4th March 2018 can look forward to little surprises at check-in, on board and in the lounges for some of its longest-standing members. In an average month, Emirates Skywards welcomes 220,000 new members across the globe. The top 5 countries with the largest member bases are spread across 4 continents reflecting Emirates’ six-continent global network. UK has the biggest membership base at 2.6 million, followed by the US with 1.8 million members. Australia has 1.7 million members and India and the UAE, the airline’s home base, follow closely with 1.4 million members each. “The programme has evolved in the 17 years since its inception in line with changing travel and lifestyle habits. 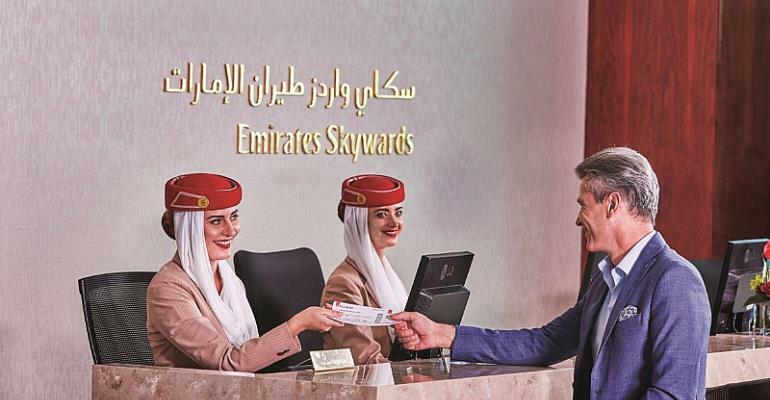 Emirates Skywards is focussed on delivering ever more personalised experiences for its members. We provide a wide array of earn and redeem options across a number of categories: travel, retail and lifestyle and across geographies, leveraging more than 100 partners worldwide,” explains Dr Nejib Ben Khedher, Senior Vice President, Emirates Skywards. Emirates Skywards’ range of global and local partners are continually refreshed and expanded to cater to the broad and diverse membership base. The programme stays relevant to its members and provides value through an increasing focus on local partnerships and personalised offers. Its most recent financial co-branded card for example was launched with Standard Chartered Bank in Pakistan, taking the total number of financial partners in various markets to 13. In the last year, Emirates Skywards has also added partners such as Mileslife, the airline miles-earning app, in China and Singapore, increasing Miles accumulation options for members and creating a seamless lifestyle experience. In addition to local partnerships, Emirates Skywards has also been applying data-driven insights to increase member engagement. The loyalty programme has been delivering more personalised and targeted offers using predictive data modelling which has been well received by its members. Emirates Skywards also has strategic partnerships with FlyDubai, Easyjet and Qantas, and 13 other airlines offering members access to one of the world’s largest networks of global travel destinations. In addition, members can also earn and redeem Skywards Miles at 1.8 million properties worldwide through its 23 partner hotel groups, making for a seamless travel journey. In 2017, Emirates Skywards members redeemed a whopping 35 billion Miles on reward flights, hotels stays and exclusive access to the biggest events worldwide. Members also redeemed 9,000 tickets to 50 world-class events including attending European Football matches, Formula 1® and the ATP Tour through the airline’s global sponsorships. Recently the programme also gave some members the chance of a lifetime with access to money-can’t- buy seats on a special Real Madrid chartered flight where members got to travel with some of the world’s biggest football stars. Emirates Skywards has earned multiple accolades over its history, including most recently being recognised with the ‘Excellence in Management’ award at the 10th annual Loyalty Awards 2018 organised by FlightGlobal and Global Flight earlier this month. The award recognises outstanding strategic thinking and team leadership at Emirates Skywards and is based on areas such as business transformation and setting innovative strategic direction. Emirates Skywards membership is free. Besides flight rewards and upgrades, members can earn and redeem Skywards Miles through over 100 programme partners including airlines, hotels and retail & lifestyle outlets. Members also enjoy money-can’t-buy-experiences at popular events worldwide and access to 41 Emirates lounges in major cities worldwide. Other benefits include lounge access, priority check-in and boarding and special privileges for Wi-Fi and advanced seat selection on board.